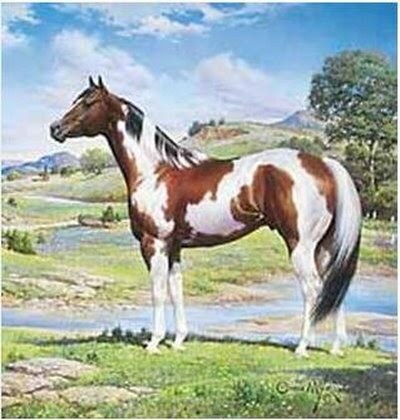 This website is dedicated to the history and ancestors of the American Paint Horse. Each horse comes with a photograph, pedigree, performance and breeding record when available. It started with the book "More than Color", compiled in recognition of the 40th anniversary of the American Paint Association, and the most comprehensive and entertaining biographical study of famous Paint Horses ever written, by noted equine historian Frank Holmes. This site is a work in progress. Help, comments and suggestions would be greatly appreciated! The name comes from the Spanish word pintado. Translated, this means painted, or in cowboy language, paint. Spotted horses and/or partially colored horses were also called calicos. This breed's history, foundation and development most probably was identical to the American Quarter Horse with one distinguishable exception: Color. It is therefore no surprise that The American Paint Horse Association was thought to be formed primarily because The American Quarter Horse Association does not register horses with white body markings (for the specific regulations on color see the AQHA official handbook of rules and regulations for 2009). It's easy to understand why this is the second most popular breed in the US. Here's the recipe: Take a Quarter horse, add color and you get a Paint. For many, this is the most beautiful horse in the world. In the 16th century, Spanish explorers sailed for the new continent and brought their horses with them. Among these horses were Spotted War horses. According to one historian, one of those horses was white and sorrel with spots on its belly. It is believed that this horse bred with American Mustangs thereby creating the foundation of the American Paint Horse breed of today. By the early 19th century The Spotted Horse, as it was called, became popular particularly among the American Indians. Commanches had many spotted horses in their herds. In August of 1962, The American Paint Stock Horse Association was founded. By the end of the year it grew to 150 members with 250 registered horses. About that same time a group of spotted horse lovers founded The American Paint Quarter Horse Association. These two groups merged into The American Paint Horse Association in 1965. "On the first day, God said 'Let there be horses'. On the second day he painted them..."